Whether you are a scrapper-in-training or would just like to do your part to recycle waste materials from your home so they can be melted down and reused again, it is important to learn the ins and outs of residential recycling; to learn what can be recycled – and what can’t. Your local scrap metal recycling facility can help you get started on your first visit, showing you where plastic and paper items or ferrous and non-ferrous metals need to be brought for recycling. Once you get the basic rules of recycling down, you can begin sorting your items properly at home to help streamline the process for future visits. Here are some tips that will help you to make money recycling household waste and unwanted items, while working to improve the local environment by reducing the number of items you personally contribute to the local landfills in Southeastern Massachusetts. When it comes to recycling, many people think that only part of an item can be recycled, when in most cases, the whole thing has value. 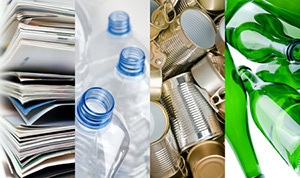 For example, plastic bottle caps can usually be recycled right along with the bottles and the lids from steel cans can also be recycled right along with the can. Each community and scrap metal recycling facility will have different rules about the types of materials that can be accepted for recycling. If your goal is to make money recycling, also spend some time learning which items hold the most value and what, if any, rules there are regarding sorting and separating by type or size. While it’s true that you can’t recycle paper or plastic items that have been ruined by grease, such as pizza boxes and other fast food items, sometimes parts of these items can be recycled anyway. For example, pizza box liners are generally ruined, but unless you got a greasy deep-dish pizza, the outer box should still be in good shape. You might not be able to recycle that wax-lined cup from the donut shop, but the cardboard sleeve should be okay. If your local recycling centers don’t accept plastic grocery bags, find which local stores accept the bags back. Many offer recycling bins at the front of the store where shoppers can drop off used and unwanted bags to be melted down and used again to make more grocery bags for future use. Find out if they also accept other thin plastic bags, such as newspaper, dry cleaning, bread bags and wrappers for paper products. While the scrap metal recycling facility might not take all of your paper products because they focus on scrap metal products, it is important to find places to recycle all of your paper products. The daily newspaper, magazines, tissue boxes, junk mail and other paper-based products should all be recycled whenever possible. Ask your local recycling centers for advice on where to take these items. When you take a road trip or make your weekly commute into the big city for work, keep separate bags in your car for trash and recycling. Pre-sorting out these items will make it easier for recycling household waste when you make your weekly or monthly trip to your local recycling centers. Good habits like these can also help you make more money recycling, collecting all the cans, bottles and other items you might just toss out at a gas station or when you get to the office. While we have been well-trained by government programs that encourage plastic, paper and aluminum can recycling, many homeowners overlook some of the most valuable materials around when recycling household waste. Metals that are found in everyday kitchen products, such as food cans, jar lids and other storage items can help you make money recycling faster than plastics and other materials. Your local scrap metal recycling facility in Westport will accept aluminum and steel, as well as a wide variety of other scrap metal items. One of the best places to find unwanted items for recycling household waste is in the garage. Basements, attics, closets and sheds are also great place to find things that you don’t need anymore that might hold significant value at the scrap metal recycling facility. Old copper pots, steel tins and glass jars can all be brought in to make money recycling. In addition to cold, hard cash, you’ll also make room and clean your house out at the same time. If you live in the Southeastern Massachusetts area or as far out as Cape Cod and Rhode Island, Mid City Scrap Iron & Salvage, which is centrally located in Westport, MA, is an excellent scrap metal recycling facility that you can use to make money recycling. Read through the website or contact Mid City direct to find out more about the items that they accept and the hours of operation at this facility. Recycling household waste can be fun and profitable if you take the time to learn the basics to maximize your earning potential.